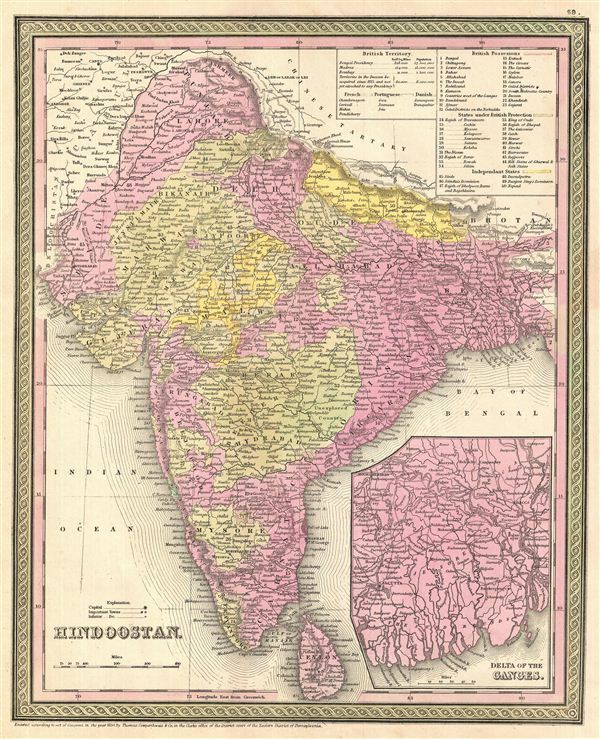 A fine example of Thomas Cowperthwait and S. A. Mitchell's 1854 map of India. Covers the Subcontinent from the Chinese Tartary in the north to Ceylon in the south, and from the Indus River valley in the west to Bengal in the east. This map includes two insets, one detailing Delta of Ganges and another listing the states of India in tabular format. The whole is engraved in Mitchell's distinctive style with green border work and vivid pastels. Political and topographical features are noted and color coded with elevation rendered by hachure. Rumsey 0537.067 (1846 edition). Phillips (Atlases) 814.